Client's inspiration- The client approached Sim-Plex to design the apartment to better suit her daily living sequence and reflect her personality. Make up table and a dress up corner are highlighted by her. Inspiration from Movie " Pretty in Pink" - Inspired by an American romantic film " Pretty in Pink" in 1986, the main actress often dressed in pink with hand-made gold and diamond jewellery as decoration. "Pink represent a courage to step through the class differences in the period. Gold and jewellery are some elements which often appear in the movie, we thought these could be well integrated into the apartment design." as suggested by Sim-Plex. 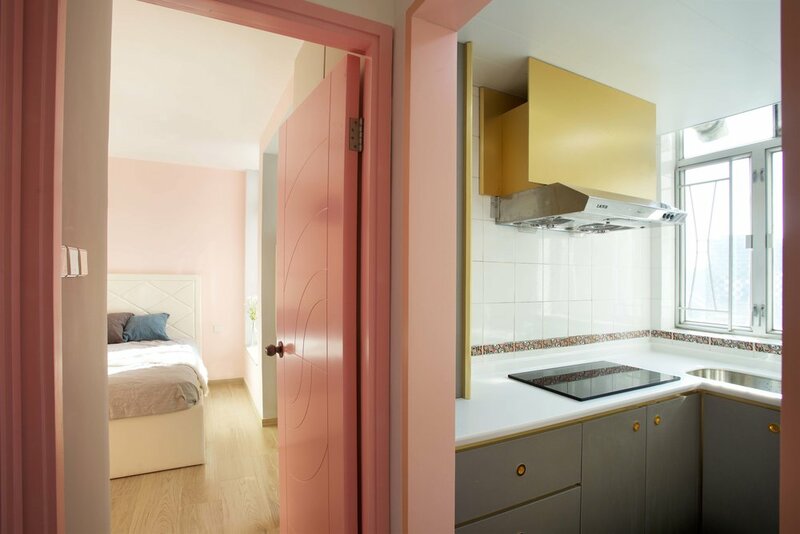 Project innovation- Pink and grey wall paint, golden frame wrapping through white cabinet, diamond or gold handle were then adopted as the design vocabulary for the apartment. In the living and dining area, pink and grey walls have been paired with a few sets of golden frame white cabinet including a dress up corner with pink seat, a TV cabinet and a book shelves. Pink as a courage? - In Hong Kong, newly developed area is often consisted of small typical unit. The space were nearly the same in common practice as the developer put as many units as possible. " We often distressed to injected new inspiration into this phenomenon. Maybe simply a pink color is one of the solutions? "laughed by Sim-Plex Design Studio.